Dutch airbrush artists Herman Veltrop joins us with this picture of Mark Hanna piloting his favourite Spitfire Mk. IX MH434 over the cloud cover. 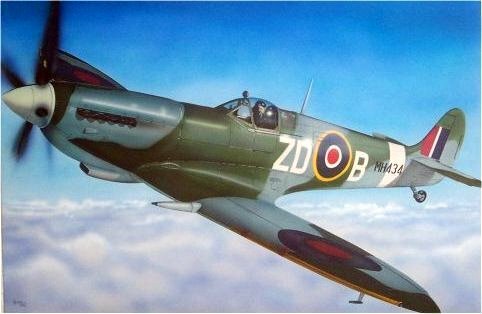 Mark Hanna was one of Britain’s most experienced pilots of historic military aircraft, and gained particular fame for his Spitfire displays. Sadly, his brilliant career met a tragic end on 25 September 1999, when Mark passed away following a serious injury in an aircraft crash in Spain.